Round 1 of the playoffs are over, and a few of our local teams seasons came to an end last week. The Chesnee Eagles fell to Union County, and two teams who improved dramatically from a year ago, the Woodruff Wolverines and Landrum Cardinals also saw their seasons finish with a first round playoff loss. Congratulation to these programs on a great 2018 season. Now to look at who is still alive and kicking for at least one more week. As I mentioned, the Union County Yellow Jackets advanced to round 2 with a 56-13 victory over Chesnee. The Jackets were unstoppable on the ground in the first half of this game averaging well over 10 yards per rush in the early going. 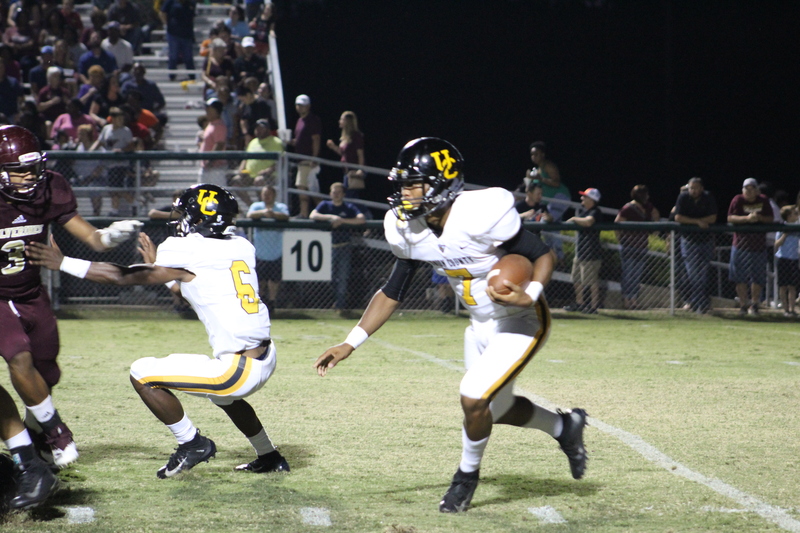 Quarterback Kesean Glover was very good as usual, as the Jackets jumped out to an early lead and never looked back. This week Union will be at home once again, this time hosting a 6-5 Indian Land team that advanced with a win over Crescent. It was Indian Land’s first playoff victory since 2005. Coach Brian Thompson has had a fantastic first year as a head coach, and I expect his debut season to continue into round 3. Union will look for the game script to be similar to last week, with the Jackets offense being able to have success running the ball, especially on first downs. I think as long as Union limits penalties and turnovers, it should be another double digit win for the Yellow Jackets. Another region champion who advanced to round 2 is the Chapman Panthers. Chapman actually trailed Emerald 28-20 in the second half before outscoring the Vikings 22-0 down the stretch. The Panthers again did it with a full team effort as quarterback Mikele Colasurdo was efficient as always, Brandon Jones ran for multiple touchdowns (including an 85 yarder), and the defense came up big again forcing an interception and a turnover on downs late in the game. This week the Panthers will host an 8-3 Camden team who advanced with a 52-10 win over Seneca. I expect more of the same from Chapman this Friday night against the Bulldogs. Look for Coach Hodge’s squad to once again top 40 points, and for the defense to again force multiple turnovers in what will be the Panthers 12th straight win. A win this week could possibly set up a showdown with Union, so Chapman must be careful to not get caught looking ahead. The best game of the week last week was without a doubt between Woodruff and Broome. Earlier in the year Woodruff smashed the Centurions by a score of 48-12, but Coach Fleming’s team would have it’s revenge in the postseason. Broome led for most of the game last Friday, but a late rally from Woodruff had the game tied at 35 with under a minute to play. Then Brenden Taylor and the Centurion offense got the ball and were able to advance it across the 50 into Woodruff territory. That’s when Owen Wilson took the field. The Broome kicker (who had missed a FG earlier in the half) then proceeded to knock down a 48 yard game-winning field goal with less than 10 seconds remaining to push the Centurions into the next round of the playoffs. This week Broome will have another tough test as they have to go on the road to face an undefeated Chester team. The question for the Centurions is how they will respond to such an emotional win from a week ago. Will they come out inspired, or will they come out flat? Broome is a very dangerous team now that they are healthy and I see this game going down to the wire much like a week ago. Chester is very talented and should be the favorite in this game, but I’m having a hard time picking against the Centurions after the complete game they put together against the Wolverines. This Broome game once again could be the best game of the week in the upstate. Round 1 was exciting and I don’t expect Round 2 to be any different. Good luck to all our local teams and bring on the Friday Night Lights! !